12 June 2008 – Flinders Ranges to Broken Hill « Travelling in an RV called "Blue Snoopy"
Blue Snoopy is a 2018 Adria Altea 402PH Sports Caravan pulled by a 2012 Nissan Navara ST Dual Cab Ute. We were up at 6.00am and ready to depart at 7.45am. We said our goodbyes and left Rawnsley Park at 8.00am. During the next half an hour, we stopped on several occasions to take photographs of the Flinders Ranges. We also had to slow for a kangaroo jumping on the road in front of us and we both commented that during this half hour period, we saw more “live” wildlife than we have seen during this trip and our previous trip to the centre. We stopped for a break in Peterborough and then drove straight through to Broken Hill. Just before crossing the border into NSW, “He” had to break the motorhome due to several emu walking on the highway. After checking into the caravan park, we visited the local mint where “She” made several purchases of silver chains. It was during this visit we spoke to a lady behind the counter who informed us they had not heard from friends who were travelling to the Flinders Ranges via the back roads. We were all surprised to find out that the friends were the couple we met at Rawnsley Park and we were able to confirm their well being. It is truly a small world. We then went to the local visitor’s centre where we collected the key for the entry gate to the desert sculptures. 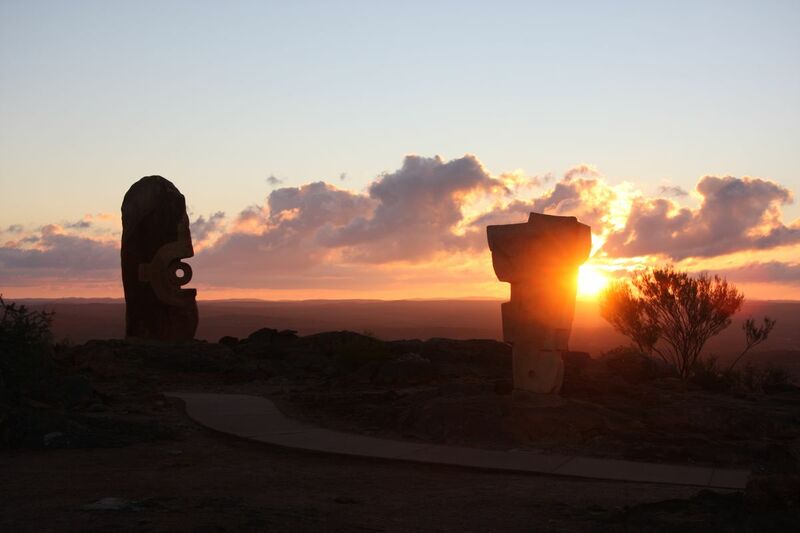 The sculptures reside at the top of a hill about 11 kilometres from Broken Hill. One of the optimum times to visit is at sunset and we gave ourselves 40 minutes to drive there and navigated through 2 locked gates. We arrived well before sunset and then enjoyed both viewing and photographing the sculptures as the sun set. We returned to Broken Hill and had a pizza in a restaurant before finally setting ourselves up in the caravan park at 7.15pm. Tomorrow we will visit Silverton.